As a wildlife biologist long involved in quality habitat and wildlife management there is one “hunter” question that pleases me more than any others, “How old is he?” as opposed to “How big is he?”. This especially if the buck is standing about a hundred yards away and the hunter is making up his mind as to whether or not he or she should pull the trigger. The fact is the hunter makes the ultimate management decisions as to whether or not the deer lives to grow older and hopefully a bigger rack. Why is age important? Whitetail bucks as a group tend to produce their very best antlers once they mature in body. With most bucks their skeletal system growth is completed when they are about 4 years of age. Some may be fully mature at 3 and others at 5 years. Up until the time all a buck’s bones are completely developed, body development is always going to take precedence over antler development. That’s why older bucks, 4 year olds and older produce the biggest antlers. If you’re interested in bucks in your hunting area producing bigger antlers they need to be allowed to mature. But they need be allowed to mature in the presence of good, daily nutrition. To some degree the genetic potential of a buck can only be determined if he starts and then continues life under ideal nutrition conditions, and is allowed to at least reach 5 or 6 years of age. Of the three major controlling factors in antler development, those being age, nutrition and genetics, the one we need to pay the least amount of attention to is genetics. We as hunters are the ultimate managers and can do something about making certain deer herds are on a good, nutritional diet. This includes keeping herds slightly below the total number of deer a given area of habitat can support even in hard times. It means doing habitat manipulations and possibly planting supplemental forage crops in terms of food plots “to help” over the rough times when quality forage and food is limited due to adverse weather. 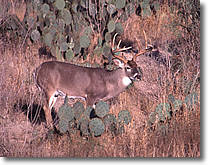 The quality of deer habitat is reflected in the antlers or mature bucks. Good habitat with sufficient food produces good antlers. We hunters can also can determine which animals we shoot. Passing up young bucks allows them to get older, some of the time. In some instances, if you pass up a young buck, he well wonder over to the next “pasture” or property and someone there may shoot him anyway. What to do? If you’re interested in increasing the average age of bucks taken in your immediate area, start passing up younger deer. But also talk to your neighbors. The reason they may be shooting young bucks is because they’re afraid if they pass them, you and your hunting group will shoot them. Talk it over around the fire pit. You just might reach an “understanding” where both hunting groups pass young bucks. These sort of informal agreements have a way of snow-balling. Pretty soon you may have a large area where all the hunters agree to pass up young bucks, and possibly take does instead. This is generally always a step in the right direction to improving the quality of the area’s deer herd, and perhaps more importantly the habitat! There are basically two ways to age whitetail bucks. One is looking at them while they are alive and the other is looking at their lower jaw to determine their age by tooth eruption and wear, after they have been taken. First let’s take a look at “field aging” live bucks. The best tips I can give at aging whitetails bucks come from experience, I have been involved in field aging whitetails for over 30 years as a professional wildlife biologist/manager as well as a guide, plus quite a few more years as a hunter. Deer age much the same way people age and it’s best to think of them in terms of immature, almost mature, mature and old. For the time being forget about antlers. True, like most any other hunter, when I see a deer I look at his head and antlers. Personally, I’ve hunted a lot of great places and as I have matured I now look for particular antler styles and the overall size of racks, and not particularly what they will score (if I’m hunting areas where bucks have the opportunity to mature in the presence of good nutrition). After a quick glance at the antlers and making certain both main beams are present, I totally disregard them and look much more carefully at the deer’s head, neck and body to determine where he falls within the immature, almost mature, mature and old categories. Besides antlers are generally not a good indication of age, beyond the very young. Essentially immature refers to yearling bucks, those which are 1 1/2 years old; almost mature refers to the 2 1/2 and 3 1/2 year olds; mature refers to the 4 1/2 to about 6 1/2 year olds; and old to those 7 1/2 years old and older. Unfortunately in a lot of whitetail country, hunters even today will see hardly any bucks that could even be classified as mature. But thankfully things are changing. Yearlings, or immature bucks have slender necks and bodies. They remind me of looks and behavior of 12 to 15 year old boys. And their hocks (tarsal glands) are usually cream-colored during the rut.